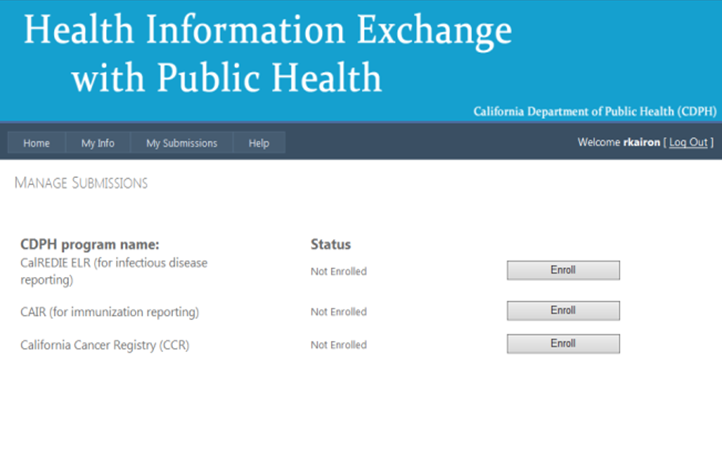 In support of physician cancer case reporting for Meaningful Use (MU), the California Cancer Registry (CCR) is working with the California Department of Public Health (CDPH) Health Information Exchange (HIE) Gateway with implementing electronic cancer case reporting. Successful ongoing submission of electronic health records (EHR) to the HIE Gateway will assist eligible participants (EP) in meeting the MU requirements. For MU Stage 3, cancer case reporting falls under the Public Health Registry Reporting measure. To participate in MU for Cancer Reporting, Physician Offices (PO) must meet the HL7 Clinical Document Architecture (CDA) 2.0 standard, and messages must conform to the CDA implementation specifications found in the Implementation Guide for Ambulatory Healthcare Provider Reporting to Central Cancer Registries. In addition, the technology used by the PO to generate the HL7 CDA .XML message has to be a Federally Certified 2014 Edition EHR technology. If you do not know your transport method, please ask your Information Technology representative or your Electronic Health Record vendor prior to enrolling to submit MU cancer data. Follow the on-screen directions to Create a New Account and Click Create Account. A "Thank you" screen will appear that references the email mentioned below. You will receive an email from HIEHelp@cdph.ca.gov, similar to the image below, requesting confirmation of your registration. 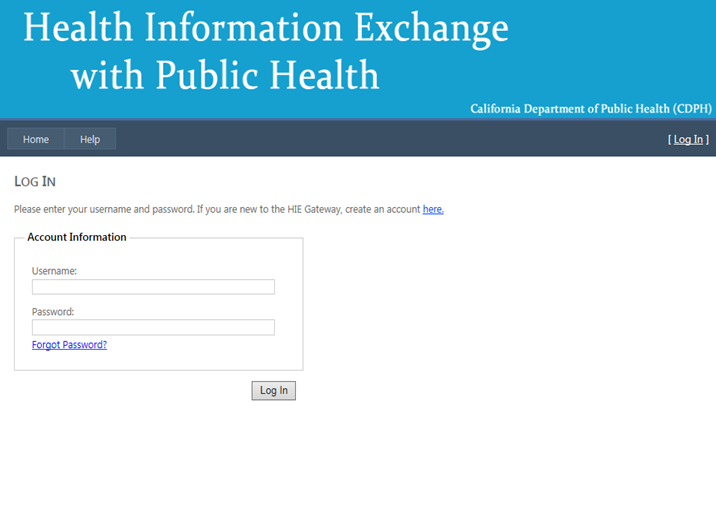 HIE account activation page is displayed. Click on the link provided. You will be redirected to the Log In page. At a minimum, please complete the required fields marked with an asterisk and then Click Submit. On the Manage Submissions screen, Click Enroll for the California Cancer Registry. 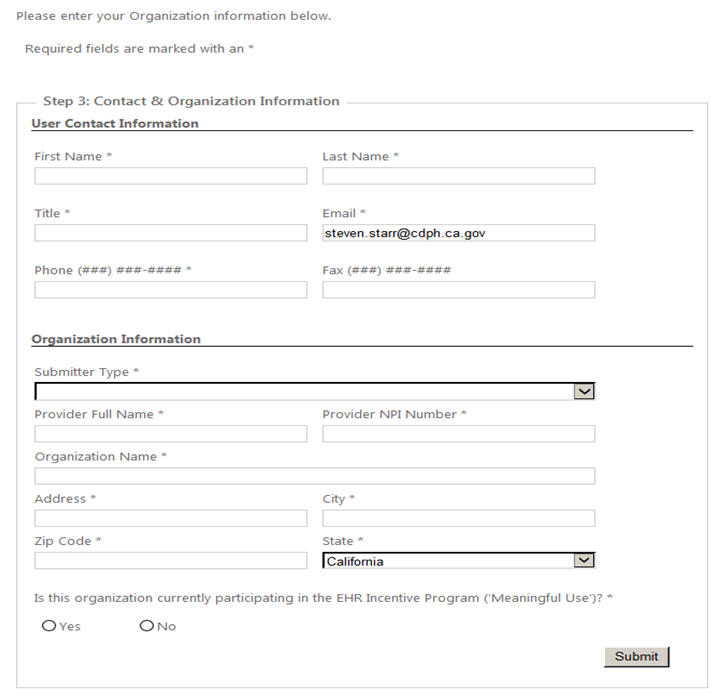 You are then directed to the CCR Supplemental Data page. Answer the questions and Click Submit. 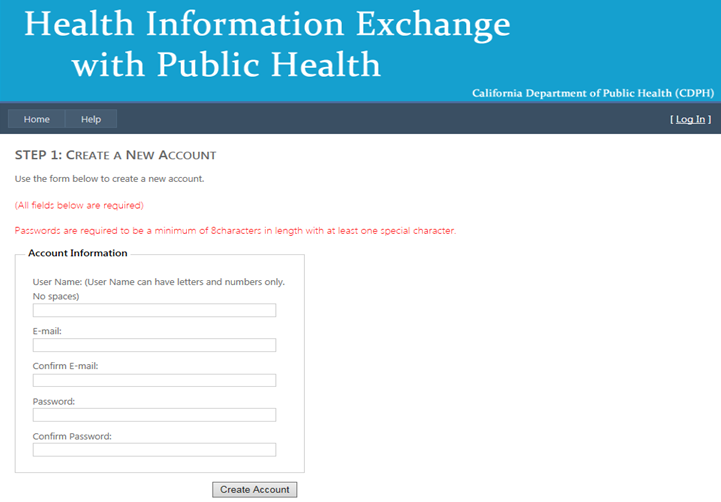 Next, you will receive an email from CDPH HIE Gateway, letting you know that you have successfully enrolled with CCR and providing you directions and options for transmitting your data. Secure File Transfer Protocol (SFTP): Go to California Cancer Registry Secure File Transfer Protocol and follow the directions provided. 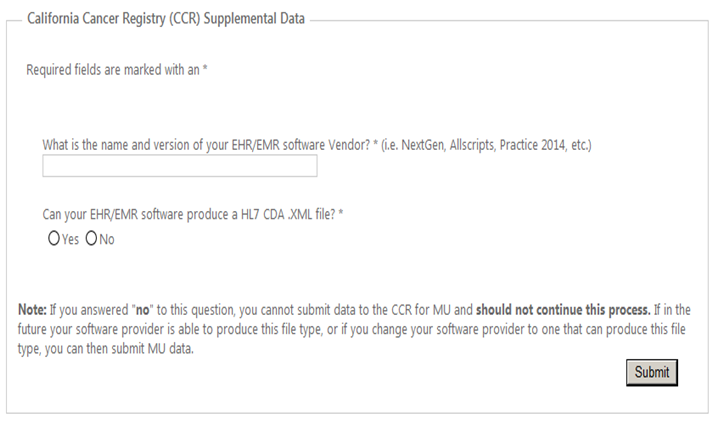 Once you have selected your transmission option, you are able to submit HL7 CDA .XML files to the Cancer Registry. For the Testing & Validation phase, you are asked to submit 5 test messages that pass the CDC Validation process. Once your office has achieved this, you will then be moved to Production for ongoing data submission. You can begin ongoing data submission in compliance with MU for Cancer Reporting. While actively engaged in the steps above, you will be receiving emails and possibly telephone calls from CDPH HIE and CCR. You should maintain copies of these communications for EHR Incentive Program audit purposes. Note: The term “insitu” must be included in diagnosis in order for early and evolving melanoma insitu to be reportable. The link below is the reportability guide for certain histologies and sites for tumors that are reportable or not reportable to the CCR. If you have any more questions specific to the Public Health-related Meaningful Use objectives, please send your inquiries to MeaningfulUse@cdph.ca.gov. For general questions related to Meaningful Use and the CMS EHR Incentive Program, please contact CMS or the Department of Healthcare Services. If you have technical questions or problems related to the CDPH HIE Gateway, please send to HIEhelp@cdph.ca.gov. if you have any more questions related to Cancer Case reporting, Please email us to MU2CCRHELP@ccr.ca.gov. Blood lead laboratory test results reportable to CDPH Childhood Lead Poisoning Branch... Coming Soon!